Today's post is a continuation of my "First-Timer Class" series. 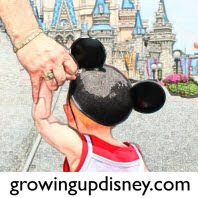 This came from helping a dear friend plan her family's first Walt Disney World vacation. If you haven't read that one yet, be sure you catch the beginning of the story. Pace Yourself: If you are traveling only with adults or with older children, you might be able to run all day from ‘rope drop’ (park opening) to the ‘kiss goodnight’ (park closing). However, if your travel party includes small children, know that you’ll need to slow down a bit. You should definitely arrive to the park of the day in advance of the opening time to take advantage of the low crowds. Plan on some sort of afternoon break such as a nap in your hotel room or resting in a quiet corner of the park while your child naps in his/her stroller. Older kids might enjoy a dip in the pool or lunch at one of the resorts as a chance to have a little downtime from the excitement of the parks. It’s warm or HOT most of the year in Orlando so be sure to take breaks in the air conditioning and drink plenty of water. Free water: Any of the Disney counter-service dining locations will give you a cup of ice water for free. The only catch is that you will still have to wait in line to make the request so this works best at off-peak times. Magic Kingdom parking: If you drive to the theme parks, you'll pay to enter the lot or show your resort parking pass for free access and then be directed to your spot by the Cast Members. You'll load the family on a tram for a ride to the front entrance. UNLESS you are going to the Magic Kingdom, that is. MK is intentionally separated from the real world and this will cost you time, so plan accordingly. It's not a huge deal; just something you should know in case you are trying to arrive in time for dining reservations. The tram at Magic Kingdom takes you to the Ticket and Transportation Center. From here, you'll board either a ferry or a monorail for a ride to the park. We typically take the ferry over and the monorail back when it's less crowded. Ride the monorail (and the boat and the bus): Walt Disney World transportation is fabulous and it's free. The monorail is a must-do, even if you just ride around and don't go anywhere. My favorite is the resort loop and with a stop at the Grand for tea but the monorail can be used for transportation to/from the Magic Kingdom, the resorts on the monorail, the Transportation and Ticket Center (MK parking lot) and you can even ride it over to Epcot. I love Disney's water transportation and take the boats whenever possible. They may not be the fastest way from point A to point B but they are usually the most relaxing. And if you can't ride a boat or a monorail, there are buses to take you just about anywhere on Disney property. Security: Your bags will be checked before you enter a Walt Disney World theme park. It's not a big deal and even though the lines can appear daunting, they move pretty quickly. To speed your way through the line, open the zippers on your bag(s) while you wait. Some guards will want to see inside every nook and cranny and others will glance and tell you to have a good day. They are only looking for dangerous items. You are totally allowed to bring food and drinks in as long as you don't use glass. Comfy shoes: Wear comfortable shoes. You'll be walking miles and miles. If you buy new shoes before a trip, be sure to wear them enough to know if you can walk and stand in them all day. Backpack: Just like the shoes, make sure whatever bag you carry is comfortable. Backpacks are very popular options. I've been using a sling-style camera bag with room for kid stuff for the last several years. You will have to open each compartment of your bag for security and because of this, some people will tell you to choose a bag/backpack without many sections. My thought is that the security process is quick and I’d rather be able to find my things easily throughout the day. So I choose and pack my bags for my own convenience, rather than worrying much about bag check. Must Try Treats: WDW offers lots of great snacks but the two that top the must-do list are Dole Whip and Mickey premium ice cream bars. Dole Whip is pineapple soft-serve with a cult following. It’s available at Aloha Isle in Adventureland at the Magic Kingdom, at Pineapple Lanai at Disney’s Polynesian Village Resort and at the Refreshment Port at Epcot. This last one was news to me. I have had Dole Whip at Epcot during the Food and Wine Festival but to me, it’s an Adventureland treat. Package pickup: Disney offers a free package pickup/delivery service at the theme parks. If you see a souvenir that you just must have but don't want to haul around all day, never fear! Just let the Cast Member know when you purchase the item and he or she can arrange for pick-up/delivery. If you are staying at a Walt Disney World Resort Hotel, your item can be sent to a designated location at your resort, usually a gift shop, and you can collect it in a day or two. If you are staying off property or are leaving the next day, the Cast Member will send the item to the package office near the exit of the park and you can get it on your way out. Or if you really don't want to worry about it, they can send it to your home but you'll pay shipping charges. Downtown Disney: Downtown Disney (soon to be called Disney Springs) is a shopping, dining and entertainment district. It is a great way to spend some time on a non-park day, or an excuse to escape the theme park crowds early. There is no entry fee required for Downtown Disney. It has a little of everything…Disney-themed merchandise, boutiques, train ride, live entertainment, Bibbidi Bobbidi Boutique, House of Blues, Cirque du Soliel, bowling, movies, more shopping, food ranging from carts to nice restaurants. The parking lots tend to fill up quickly and Disney is building parking decks to help this situation. My favorite way around dealing with parking is to take a water taxi (free) from Old Key West. They are also available from Port Orleans Riverside, Port Orleans French Quarter, and Saratoga Springs. Buses run to and from all of the WDW Resorts but there is no direct connection between DTD and the theme parks. Mini-golf and water parks: Walt Disney World has two miniature golf courses and two water parks. I'm not a water person so I can't speak from experience on the water parks but my family loves the mini-golf courses. These are a great way to spend an afternoon and provide a pleasant break from the crowds of the theme parks. Our favorite is Winter Summerland, with its year-round Christmas theme and sand and snow courses. Meals at resorts: Since Jennifer’s family didn’t have much time at the parks, I suggested she plan character meals at Disney's resort hotels on their non-park days. This allowed them to enjoy the character meals without spending valuable park time as well as giving them an excuse to check out a couple of the Disney resorts. And don’t feel limited to character breakfasts, the Disney World resorts offer some fabulous dining options for all times of day and all sorts of cuisines. Photograph things you don't want to lose: You aren't handed many cards at Walt Disney World anymore but if you do have a physical park ticket, PhotoPass card, or anything else you'd be upset without, take a picture of it so you have the important numbers should the card be misplaced. Same thing for parking. Take a picture of the row number and then you won't be wandering at the end of the night. And kiddos! Line them up for a quick pic in the morning. Then you'll have exactly what the child is wearing should a Cast Member have to help you find them. Thankfully the only place I've ever lost Tink at WDW was the playground at the Studios. She was way back in one of the tunnels having a blast pretending to be an ant and a Cast Member quickly found her. This isn't the end! There will be one more post in this series. Don't miss it!